Our Punch Tool's custom curtain wall punch press are designed to save you time on installation and create identical punches for a clean and efficient production. Our custom standalone hydraulic punching presses allow you to place and punch countersunk holes or deadbolt knockouts on all aluminum curtain wall extrusions for perfect curtain wall mounting to fit your design needs. 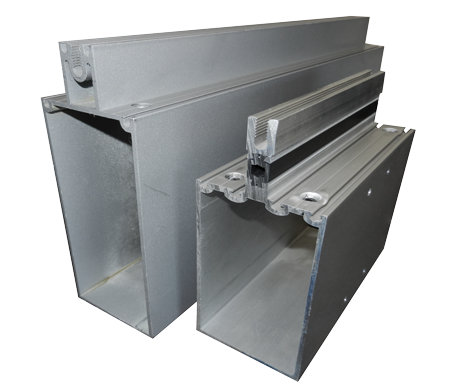 Here we have two examples of our curtain wall mullion mounts, made out of aircraft grade aluminum extrusion, with multiple countersunk mounting holes punched in difficult locations between screw chasers. 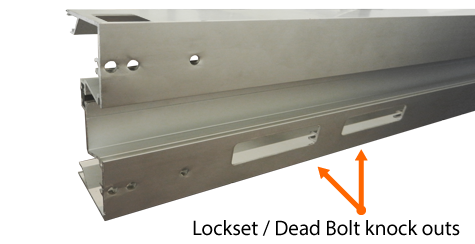 The smaller aluminum extrusion mullion had the challenge of needing to place the counter sunk holes in between two screw chaser channels. The design problem was solved by using a two part punching press operation to first punch a smaller hole in place and then countersink them. This stopped the area surrounding the screw chasers from deforming in any way leaving the piece structurally sound. Alternate views of the smaller aluminum curtain wall industry extrusion highlighting the countersunk top punched holes and their difficult placement in between screw chasers. A side view of the smaller aluminum curtain wall extrusion highlighting the punched side mounting holes. The larger model had a similar design challenge placing the countersunk rounds beside screw chasers so the same method as with the smaller extrusion was used of a hole punch followed by a countersinking. 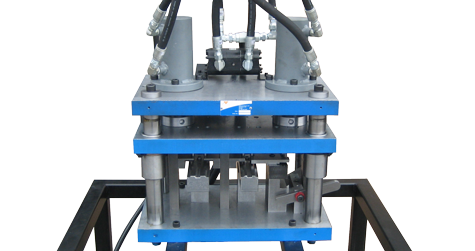 This Punch Tools standalone hydraulic Punch Press is responsible for a two step punching and countersinking process that creates the countersunk punches in the above curtain wall aluminum extrusions. A different style of aluminum curtain wall mounting extrusion with multiple hole punches perpendicular through screw chasers and lockset / dead bolt knockouts places on multiple surfaces of the piece. If you have any questions or would like to discuss a project drop us a line and we’ll get back to you promptly.